Manchester City are reportedly ahead of Barcelona in the running for the potential €60million transfer of Bayern Munich midfielder Thiago Alcantara. That’s the claim being made by Spanish outlet Don Balon today, with Pep Guardiola perhaps unsurprisingly after a new signing in midfield for next season. 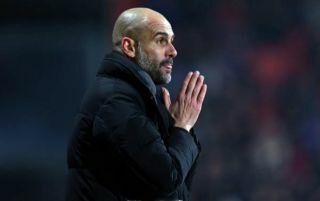 Guardiola will know Alcantara well after working with him at both Barcelona and Bayern, and he could do with him now as a replacement for the ageing Fernandinho. The Spain international seems a good bet to do that job for City, and would surely adapt well due to knowing what Guardiola wants from him. Still, Barcelona fans won’t be too happy as it seems they could miss out on re-signing their former player, who once looked set for a big future at the Nou Camp after coming through the Catalan giants’ academy. City are currently ahead of Liverpool in the running for this season’s Premier League title, and a signing like this for the summer would also surely put them in a strong position to dominate again next year.